John McLain – Resource Concepts, Inc.
Mr. McLain co-founded RCI in 1978 and is an energetic force in resource management throughout the western United States. Presently, as Principal emeritus, Mr. McLain serves as a project manager for RCI range management and natural resource related projects. Mr. McLain has worked to develop numerous rangeland management, pinyon-juniper, sage-grouse habitat, cheatgrass and wildland fire initiatives, including the Nevada Range Monitoring Handbook, establishing the Great Basin Plant Material Center and the Nevada Biomass Coordinating Group. 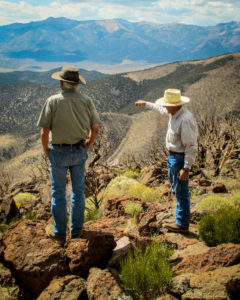 Mr. McLain was instrumental in organizing the 2007 Great Basin Wildfire Forum – The Search for Solutions that brought together 16 recognized scientists regarding cheatgrass and wildfires, rangeland restoration and improving sage-grouse habitat. He has testified before Congressional Committee with respect to public lands natural resources. Mr. McLain is a Certified Range Management Consultant and Certified Professional Soil Erosion & Sediment Control Specialist. John enjoys time at his cabin in the Sweetwater Mountains with family. Favorite Quote: Excellence is the result of caring more than others think is wise, risking more than others think is safe, dreaming more than others think is practical, and expecting more than others think is possible.